The holiday celebrates the end of the harvest season and marks the start of a new year (and also the start of the truly hot hot season). Although the holiday is officially only three or four days long—in 2019 it’s April 14, 15, 16—it can extend onto one or both adjoining weekends, and often even a few days before that. In the days leading up to Khmer New Year, prices, especially for transportation, can go much higher than usual. It’s true that Cambodians get to have an awful lot of new year celebrations, and it was pretty recently that we celebrated the Gregorian or international new year in January and then Lunar New Year (also called Chinese New Year) in February. But Khmer New Year is different — it’s Cambodia’s most important holiday and one of the only times during the year that Cambodians get substantial time off from work. Houses are decorated with stars, fairy lights, plants, and various food and drink (usually Fanta) offerings, and everyone wears new clothes. There are always several pop songs released by Cambodia’s most popular singers every year in celebration of Khmer New Year—this is what 2019 has to offer. Num ansom sach chrouk, sticky rice with pork and mung beans, is a savory snack traditionally eaten at Khmer New Year. Traditionally, Khmer New Year was when everyone who was born in that year would count themselves a year older. So in a sense, it was every Cambodian’s birthday. This goes a long way to explaining why you’ll hear booming music out of most houses in the countryside this week, and why you’ll hear endless amounts of karaoke until the wee hours. It’s a birthday party for the entire country! These days, though, more and more Cambodians are keeping track of their actual date of birth, but that hasn’t stopped everyone from partying at Khmer New Year. 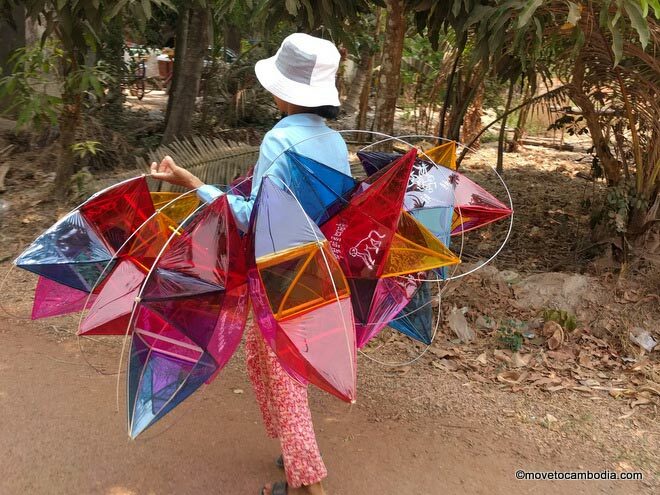 On the first day of Khmer New Year, called Maha Sangkranta, people wear new clothes to welcome the “angel” of the new year that comes on this day. In preparation they clean and decorate their houses and put special food offerings on the spirit houses outside of their homes. It is also traditional to wash in holy water three times, and to bring food offerings to the monks at the pagoda. 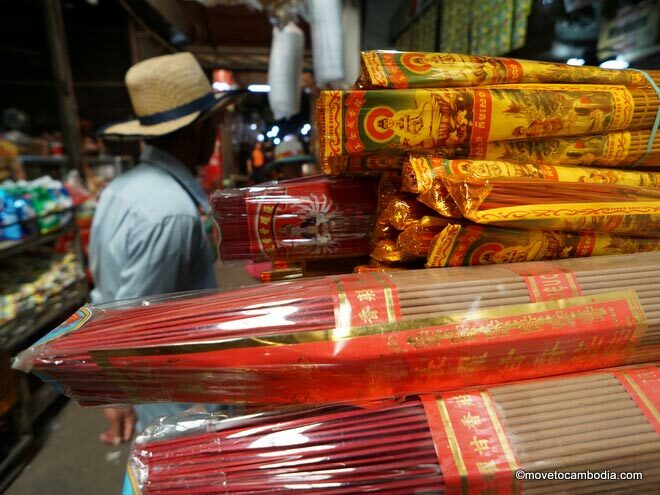 Incense on sale in Siem Reap in preparation for Khmer New Year. The second day, Vearak Vanabat, is the Day of Giving, and Cambodians traditionally give gifts to their families and make donations to the poor, as well as going to the pagoda for blessings. On the third day, Vearak Loeung Sak, it is traditional to wash statues of Buddha and one’s elders with sweet-smelling water, and of course, another visit to the pagoda. During Khmer New Year, Phnom Penh is eerily quiet, with most restaurants and businesses closed to allow their employees to head home. In Siem Reap, it’s just the opposite. The city is festooned with New Year’s stars, and the road to the temples have holiday decorations all over them. It’s a holiday tradition to head to Pub Street, and for once, tourists are barely visible among the thousands of Cambodians that are out, enjoying the live music and performances. 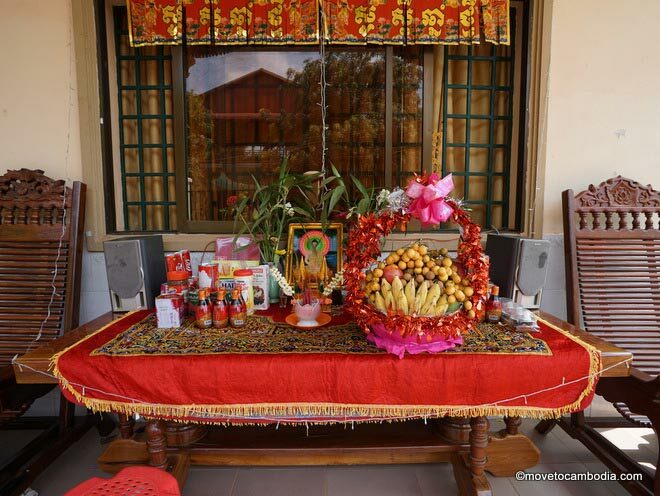 A typical household display of offerings for Khmer New Year. In Siem Reap, a three-day New Year’s event at the Angkor temples called Angkor Sankranta takes place that is very popular with Cambodians who go to play traditional games. For the last two years running, there were world record set for the largest sticky rice cake in the world made from sticky rice, mung bean, and pork, and then later a rice cake-eating contest. Unfortunately there will not be any events at the temples in 2019, but there are events taking place around the country. In Phnom Penh, there are usually fireworks and you’ll see impromptu parties set up with a boombox playing Khmer tunes in the street. Cambodians who haven’t been granted enough time off from work to head to the provinces wander past, stopping to have a cheerful dance in the streets. Wat Botum Park is also a good place to visit to see traditional games being played, and this year, in 2019, there are festivities planned at Wat Phnom. Khmer New Year is a good time to get out of the city and check out the countryside, where you’ll find lots of parties, friendly neighbors and happy children. Don’t be surprised if you’re invited to join in the celebrations. Susaday Chhnam Thmei! 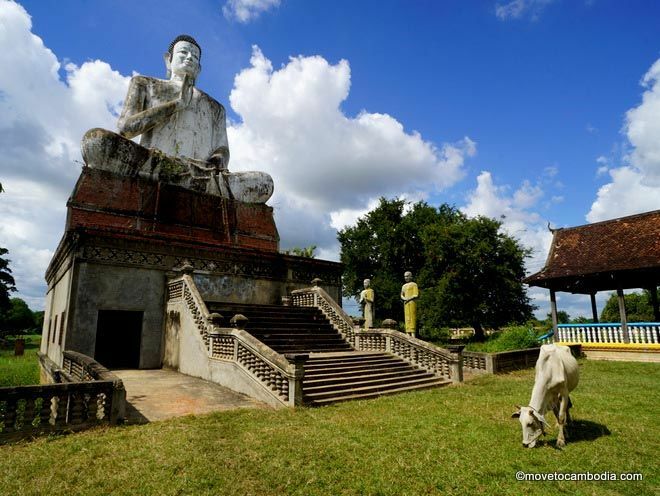 This entry was posted in Holidays and tagged Khmer New Year, Chol Chhnam Thmei. Bookmark the permalink. 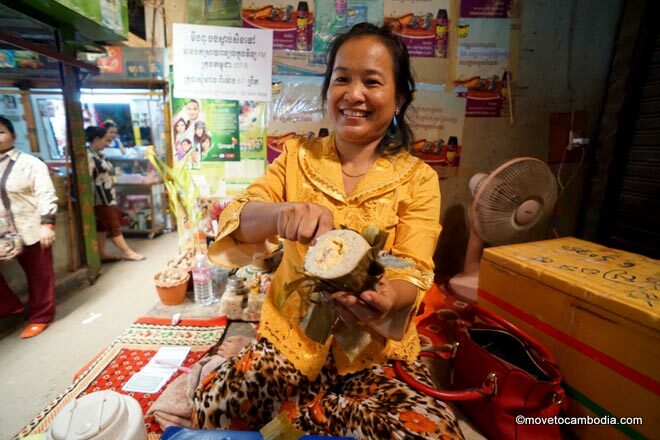 6 Responses to Happy Khmer New Year! 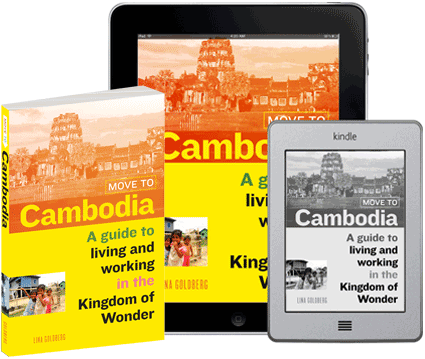 Great blog ive used it for two weeks around cambodia! One thing for passing through around khmer new year — yes PP is quiet and not fun. But you failed to mention the ABSOLUTELY INSANE WATER MADNESS happening in Siem Reap. Forget lame old Pub Strret — every street in town is lined with 10 year okds shooting water cannons at every tuk tuk that passes by. The city is completely drenched. The electro rave concert at the royal palace is just an excuse for huge cannons to shoot at the party goers. People without water guns just grab hoses or fill buckets to dump on their friends. It’s complete madness. And sooooo much fun. Go prepared in cheap clothes and flip-flops, and if you want to participate, water guns are avail at all the stores. They even have cool ones atrached to a backpack so you dont run out of water! Have fun y’all! Thanks for the update, Timo! I wasn’t in Siem Reap this year but in previous years they had banned water fights for the most part. Last year they started selling water guns again, but it sounds like they’ve lifted the bans completely. Hello, may I ask you. I’ve read the online news about Cambodia that there is a train that that connect Downtown-Phnom Penh International Airport. But I can’t find where the location of train station that close to the airport. can you explain how to get the train if we from the airport? Hi, first of all — a terrific blog. Really useful, precise, updated — and I like your choice of everything from hotels to routes. And now the question about the traditional western new year’s eve – is it a holiday of any kind? how to find a nice place in Siem Reap without falling into cheese performances and semi-corporate booze parties of the Pub street? Western New Years is a holiday, particularly in Siem Reap where there are festivities around Pub Street. However, it’s not like Times Square or anything like that. The major hotels also have parties. The best thing to do is check the Expats and Locals in Siem Reap Facebook page a week or two in advance and you’ll see all of the various celebrations being advertised and you can choose the least cheesy of them. I’ll be in Phnom Penh in April 2017 which I’ve since learnt will coincide with KNY.It wasn’t planned that way.!! Should I change dates.? Will the usual Tourist places be open..the Royal Palace, National Museum etc. It will be nice to join some form of festivities, but would also like to see the usual things.